In the chase for survey success, the big four radio networks are using the promise of “big bucks” to lure the listeners in. Just two weeks into survey one and millions of dollars are on offer across the AM and FM bands. 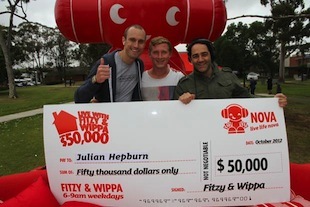 In Sydney, Triple M and Nova 96.9 got the ball rolling with a prize promise of $1 million. Upping the ante, the Triple M breakfast show of Lawrence Mooney and Gus Worland ‘outbid’ Nova by upping their giveaway by $10.00. Jonesy & Amanda at WSFM got in on the act with their Million Dollar Bribe. But then, ARN pulled out the big guns for their KIIS FM Sydney and Melbourne. In what’s been dubbed to be “the biggest cash prize ever”, the network has put a staggering $5,000,000 on the table. The contesting for KIIS’ 5 Million Dollar Free Money Frenzy Giveaway will be shared by The Kyle and Jackie O Show in Sydney and Melbourne’s Jase & PJ Breakfast Show, with further opportunities during the day and into Drive with Will & Woody. They’re not the only ones looking to throw the cash at listeners though. Triple M: Millionaire Listener with 2MMM offering an extra $10. Not to be outdone, 3AW, 2GB, 4BC and 6PR are running the $150,000 Bill Buster. Listeners have never felt so wanted. i heard KIIS do a contest spot for 5 mil at nights last night on teh new show which is impressive for us shift workers~! Cash calls, mystery voices (smooth stars), secret sounds and pay your bills………1982 was a formative year for radio in Australia.